Sixty or seventy years ago, eating out in a restaurant or buying takeout food was practically nonexistent in our community. 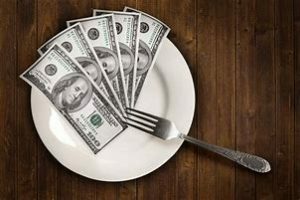 Kosher eateries were very rare, and most people weren’t able to spend any extra money on what, at the time, was an extravagance. Even in the non-Jewish world, the idea of fast food style restaurants had not yet infiltrated our culture. (McDonalds started in the early 1950’s, and it took a while to manifest itself into becoming a norm of society.) But today, every type of Glatt Kosher Mehadrin eating establishment exists—from pizza/falafel shops, to burger joints, to upscale-sit down restaurants! Going out to eat has become a norm for much of the population and is no longer very expensive. However, eating in a restaurant, of any kind, can contribute to poor health and weight gain. Yet with a few adjustments, eating out can be a pleasant experience. In fact, when not done too often, it can even be a positive health experience. Just like anything else involving eating, planning can make a big difference. Getting menus ahead of time is easy in today’s world. Check online to see if there is a website with a link to a menu. This way you can decide what you are ordering ahead of time and remove a lot of the temptation of thinking “at the moment” and making poor choices. The biggest problem is the amount of food served. A regular full course meal in a fine restaurant is actually enough food for 6 people. Food establishments compete with each other not only in the quality of the food, but also in the quantity. The average 4 course meal in a restaurant today can be enough food for about 3 people. So tip number one– share your food with someone. Another suggestion is to order just a bowl of soup and an appetizer instead of a main course. Also, don’t be shy, ask the waiter for a “doggy bag” right at the beginning of the meal and take home half for another day. You can also check if half portions or children’s sizes are available. How food is prepared is certainly a huge consideration. Restaurants generally are concerned with taste and the presentation of their food. They are usually not concerned with the caloric content of what they serve and they don’t care too much about the nutritional factors involved in how they prepare or cook their food. 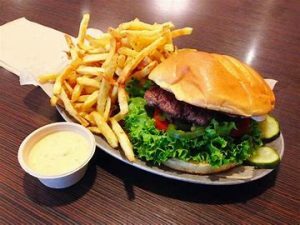 Restaurants use more unhealthy fats, sugars and salt than most of us would use in our own kitchens. Flavor enhancers such as MSG are also very common–particularly in oriental–style eateries. MSG often leaves a person with a headache and bloating and if there is a strong sensitivity or allergy to it, the effects can be more severe. Ask how certain dishes are prepared. Many seemingly healthy choices are prepared with margarine or butter. Ask for the vegetables without butter, sour cream, and high-fat sauces. When going to Sandwich Shops, just cut the sandwich in half and save the second half for the next day. At a fast food outlet, go for the grilled chicken instead of that double burger. At Salad Bars, avoid the marinated and oily salads. If you go for Pizza, order healthy toppings and less cheese on the pizza. If you like Chinese, request that your vegetables be stir fried or steamed with as little oil as possible. Most times, eating out is either a social occasion or a meeting of some nature. This also means you are sitting around the table for a long time– a much longer time than one normally would need to eat. And with a bread basket sitting in the middle of the table (that is often refilled), with the presence of a variety of dips and salads on the table to start, it is quite easy to exceed normal caloric intake before you begin the main course. Take a slice of bread or two and make sure that bread basket doesn’t come near you again. Prepare yourself before even entering the restaurant. If you know ahead of time that you will be eating out, start cutting back on your daily consumption even two days before. Don’t arrive very hungry. This will surely put you in overeating mode. 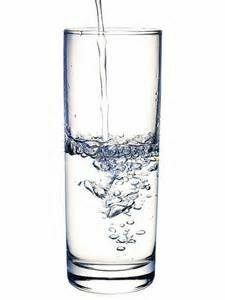 Drink plenty of water before you start the meal to keep you full and hydrated. Desserts are a particular problem. They are usually very rich, very high in calories and often time contain non-dairy whips and creamers that are loaded with trans-fats and chemicals. 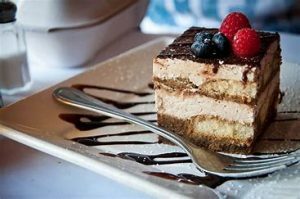 Mousses, cakes and chocolate delights are indeed temping and usually they look great; they often look better than they taste. Some restaurants also offer fresh fruit for dessert. You can also opt to skip it altogether (and save some money, too!). Fast food establishments are even more challenging health-wise. Even the “fresh” salad bars are sometimes sprinkled with the highly allergic sulfites in order to preserve the vegetables. But if you are in a situation where you must resort to fast food, keep your portion sizes under control and go for the leanest choices. Order “small” as opposed to medium or large sizes. Drink water instead of colas and other sweet drinks. Eating out can be and should be an enjoyable experience. After all, you don’t have to wash the dishes and clean up and you don’t have to cook and serve! Enjoy the company and the ambience, but at the same time, don’t harm your health. It’s very tempting to get huge portions because they make it worthwhile financially. You are getting more for your money, but it can cost you in health. Very timely! Just today, I read a Channel TV news article on research done in Israeli restaurants. Very often, the calorie count for one dish is 2,000 calories! And that’s for a salad with legumes. Enormous portion, needless to say. Thanks for your tips!